Muhammad Ali (born, Cassius Marcellus Clay born on January 17, 1942) the former 3-time heavyweight boxing champion of World and Sportsman of The 20th Century died on June 3rd 2016 and was laid to rest today on June 10th 2016. There is no doubt his boxing, athletic, political and social activism during the Vietnam War and Civil Rights Era made him one of the most influential people not only in America but also, around the World during the latter half of the 20th Century. Ali was famous throughout the world for his “trash-talking” (sports psychology), quick-whit, humor, commitment to his religion (Islam), the uplifting of his people (African American Community) and commitment to World peace; however, what about his role as an entrepreneur? Yes, you got it right! Entrepreneur and I mean that with all seriousness because that was a title most assuredly bestowed upon the man called the “Greatest”, because of his actions both in and out of the boxing ring. Admittedly, the term entrepreneur and Muhammad Ali doesn’t immediately intersect, so let’s explore how, when and why. Perhaps his history will clarify things and create a better understanding about the man and his passion to solve problems. So, how does Muhammad Ali, fit the description of an entrepreneur? Well, let’s recall that an entrepreneur is often perceived as a business leader, leader and/or innovator that thinks outside the box and willing to assume all risks and rewards in pursuit of achieving a specific goal through new ideas and business processes. In essence, he or she is frequently anti-establishment because the core of entrepreneurship centers upon creating and implementing new ideas and/or methods of solving problems. Now, being a Blackman in the segregated Southern United States during the turbulent 1960s consisted of extraordinary structural challenges that restricted the personal freedoms and liberties of millions of people of African descent and the poor. With remarkable boxing skills, commonsense, courage, incredible oratory skills and a global platform to express his thoughts and feelings Muhammad Ali, began the task of addressing racial, economic, social and political injustices imposed not only upon his fellow Black Americans but, other poor and disenfranchised people throughout the world. Needless to say, Ali’s name and reputation brought significant influence to a problem that could be and often monetized into a solution to a conflict. Yes, the Ali Brand was capital or fiat currency, which is the genesis of what is today called social entrepreneurship. Indeed, Ali sought social change through a business approach. Trust me, Branding the name Muhammad Ali is big business. “we cannot solve our problems with the same thinking we used when we created them” …Albert Einstein. It’s Darwinian, you either adapt or you die. 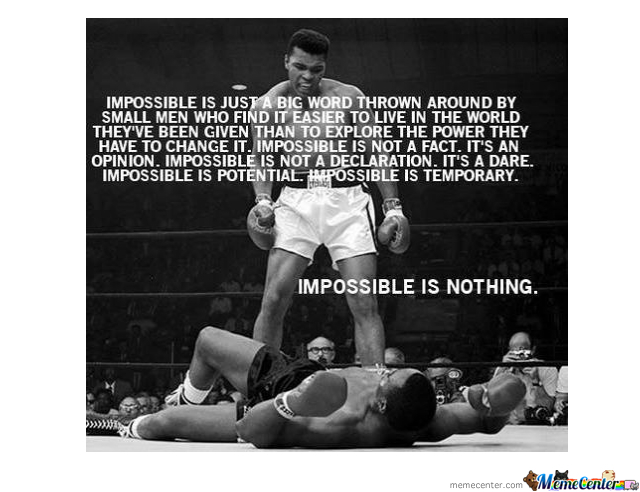 Hence, Muhammad Ali epitomized the Darwinian Theory of Survival of The Fittest. Now, Muhammad Ali, was an excellent marketer and self-promoter of himself and the sport of boxing through his poetry and ring psychology that told a story of him being the chosen one and would overcome all barriers/challenges. In fact, Ali shared about his promotional skills being influenced through professional wrestling’s late icon “Gorgeous George”. Like Gorgeous George, Ali was a showman that could sell and put backsides into seats, while generating massive revenue through his big-mouth and charismatic personality. Needless to say, Muhammad Ali was very confident in his abilities or according to his many detractors was arrogant and needed to be slapped down and put into his place. Does this sound familiar? Like all entrepreneurs Ali, encountered extreme opposition and made the appropriate adjustments (physically, emotionally, psychologically and religiously) to achieve, success. No Poverty Mindset existed with the Greatest nor would he allow barriers (racism, death threats, being stripped of the world title for refusing military induction, l*** of boxing license, etc.,) to kill his dream. If, you compare the entrepreneur and athlete then, you eventually, come to realize they share many of the same qualities such as the following: disciplined, hardworking, self-confident, leadership, passionate, long-term thinking, having to prove something and possessing a Millionaire Mindset. Hence, you can see many of the aforementioned qualities in Muhammad Ali, which in true entrepreneurial fashion explains his desire to make significant social change in the world and an inspiration to hundreds of millions of people around the globe. The parallel between Muhammad Ali and Social Entrepreneurs such as Steve Jobs, Richard Branson and Bill Drayton, are clear as indicated by their respective desire to solve social problems or make things more efficient for the greater good of collective society. One of the lasting legacies of Muhammad Ali was his push for what is called “Ethnic Entrepreneurism” (cultural economics) within the African American community. Ali often shared about the need for blacks to build their own banks, schools, theatres and overall, economic infrastructure to sustain its own community due to economic deprivation resulting from historical barriers (Slavery, Jim Crow and Anti-Poverty Laws) that continue to impact the black familial structure. Since, wealth is a generational game but, your community has been systematically denied opportunity to participate and grow due to an uneven playing field then, it’s of the utmost importance to invest your resources with others who look like yourself. Indeed, charity begins at home or more accurately, in your community. There is no doubt familial instability continues to function as a primary factor of economic instability that is better addressed through efforts of both ethnic and social entrepreneurship. Muhammad Ali, often spoke of the importance of the people to develop the skills and abilities to pull themselves out poverty rather than reliance on government that has its own political and/or ideological motives. It’s clear Ali, was about the people and viewed their salvation would best have achieved through their own efforts which reflects the importance of his role as an inspirational figure of hope for millions of average individuals but also, entrepreneurs.